President Francois Hollande’s parliamentary majority will give him the opportunity to push through budget and tax reforms, and to move away from austerity towards growth. FRENCH PRESIDENT FRANCOIS Hollande’s Socialist Party looks likely to take control of the lower house of the country’s parliament after voting in the first round of parliamentary elections yesterday. The conservative party of former President Nicolas Sarkozy, which has controlled the 577-seat National Assembly since 2002, will likely lose its grip on power in the final round of voting in a week. Hollande’s parliamentary majority will give him the opportunity to push through budget and tax reforms, and to move away from austerity towards growth. Polling agency projections after yesterday’s first round of voting in legislative elections show the Socialists slightly behind Sarkozy’s UMP party. But other leftist parties expected to support Hollande — including the communist-inspired Leftist Front and the main environmental party — did well in yesterday’s voting. A leftist victory in the voting, five weeks after Hollande took office, would brutally jar the French political landscape. Leftists are forecast to take between 300 and 366 seats in the next parliament, and the conservatives between 210 and 270 seats, according to the CSA and TNS-Sofres polling agencies. That would be a sharp shift from the current parliament, where the conservative UMP and its allies had 346 seats and leftists 226 seats. Sarkozy’s party, the Union for a Popular Movement, or UMP, is trying to save its honor. Leading UMP figures vowed not to make alliances between rounds with the extreme-right National Front, which moved into position to grab its first small presence in parliament in more than 25 years. Eyes are on the National Front at voting time both because of the stigma of racism and anti-Semitism which clings to the party and because of its potential for cutting into the win margin of the mainstream right. It’s estimated that leftists parties have taken about 47 per cent, with the right taking 35 per cent, and the National Front on around 13 per cent, according to The Guardian. Turnout was relatively low, estimated at 57 percent, well below the 63 percent in the last parliamentary elections five years ago. The newly revamped National Front party failed to fully capitalize on the solid third-place showing of its leader, Marine Le Pen, in the presidential race. The National Front wants to pull France out of the euro currency, secure French borders and stop immigration by Muslims whom it claims are bent on the “Islamisation” of France. It could still decide races in a number of districts by throwing support to the UMP candidate — or withholding it. And the far right can nourish hopes of winning in up to three districts, according to polling agencies. Hollande’s Socialists appealed for support in next week’s final race. Should they lose in a surprise comeback by the right, Hollande would be forced to appoint a conservative prime minister and carry on in what the French refer to as “co-habitation,” in which life can be as tense as within a bickering couple unable to repair their relationship or to divorce. A Socialist win would give the left control of both houses of parliament and the regions. Socialist Prime Minister Jean-Marc Ayrault called on voters to give the government a “large, solid and coherent majority” in the second round so “the change you voted for 6 May can be put in motion”. “If that is not the case, then the fair recovery of the country, with justice for all, cannot take place,” Ayrault said. Hollande promised to rectify what he said was years of injustice under Sarkozy, from making the rich pay higher taxes to creating 60,000 posts in the educational system trimmed by the previous government. He also promised to ensure that the European Union’s budget-cutting pact to ward off instability is reworked to emphasize growth, not austerity. The French vote will have an impact on Hollande’s bid to inject the growth-promoting measures, because he needs the political legitimacy that a strong majority would confer to carry weight in his dealings with German Chancellor Angela Merkel, opposed to such changes. And he needs French parliamentary backing to approve bailouts or EU-wide treaties. Conservatives warned that the Socialists’ spending plans could cripple France just as it and other European countries are being asked to rescue Spain. Sarkozy’s campaign spokeswoman and a conservative parliamentary candidate, Nathalie Kosciusko-Morizet, claimed that Hollande’s team is already spending so much that it is taking France towards “bankruptcy, a Spain-like, Greek-like situation”. France’s decisive second round election falls on 17 June, the same day Greeks are voting in new elections that determine whether Greece sticks with the heavy budget cutting required under the terms of an international bailout. The French right maintained hope for a turnaround in the final vote. “We’re not giving up”, conservative former Foreign Minister Alain Juppe said on TF1 television. The National Front fielded more candidates than any other party — 571 — many of them new to politics. Le Pen denounced the voting system as “profoundly undemocratic” because it has deprived her party of representation in parliament despite relatively large voter support. The National Front put 35 lawmakers in the lower house under a proportional voting system put in place from 1986-1988 by then-President Francois Mitterrand. Hollande has promised to institute a measure of proportional voting. 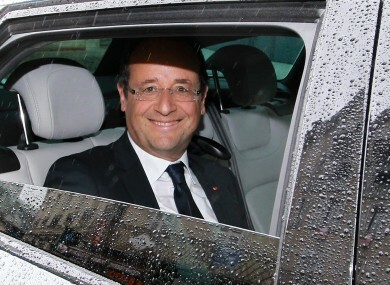 The new lower house serves for the next five years, coinciding with Hollande’s five-year term. Most of Hollande’s Cabinet members — 25 of 35 — are running for parliament seats as well, and they could lose their jobs if they don’t win election. Email “France's Socialist Party poised to take parliamentary majority ”. Feedback on “France's Socialist Party poised to take parliamentary majority ”.